Today is National Shimp Day. Anyone who knows me knows if there was one food I could live on it would be shrimp. I often joke that I never met a shimp I didn’t like. One way I like them the most is cooked on the grill. I have some recipes I would like to share with you. These are in my recipe file box so I am not sure where I came across them but have tried them all and love them. If you see one that you have seen before please let me know where, because I believe in giving credit where credit is due. When grilling shrimp it is best to do it on skewers. Skewers make it much easier to handle them. I think it is best if you put them on the skewers lengthwise, this way they dont curl up as they cook. Also do not push the shrimp to close together on the skewers, doing so will cause an uneven cooking. Shrimp are best grilled quickly but not over too high of a heat. You should cook on medium heat, or test by making sure you can hold your hand comfortably over the heat for 4 seconds. This being said, I hope you try and enjoy one or more of these recipes. Mix all ingredients, except shrimp. Add shrimp,cover & marinate in refrigerator forat least one hour. 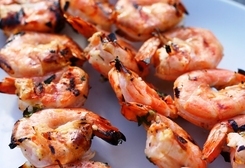 Thread shrimp onto skewers and grill Until throughly cooked. Mix all ingredients except shimp in bowl . Marinate in the fridge at least 1 hour. Spear shrimp on skewers and grill until done. Mix Ingredients except shrimp & bacon in mixing bowl. Add Shrimp and marinate Shrimp for an hour or more. Partially pre-cook bacon & let cool. Lightly oil the grill. Remove shrimp from marinade, then wrap bacon around shrimp, securing it with a toothpick. That looks delicious! I haven't done much cooking with shrimp, I find them too tasty to just eat by themselves! Very nice! I'm going to repost that this week.